IRVINE, CALIF., May 12, 2016 – Adding to the constant evolution in telematics and infotainment, Kia Motors America (KMA) today announced that the 2017 Sportage and 2016 Optima, when equipped with a compatible navigation system or UVO3, will be offered with Apple CarPlay® compatibility when the vehicles arrive at Kia retailers during the second quarter. Additionally, customers who have previously purchased the 2017 Sportage or 2016 Optima equipped with a compatible navigation system or UVO3 will be provided with a downloadable update via myuvo.com that will be available beginning in the third quarter. Currently on sale, the 2017 Sorento is the first Kia vehicle to be offered with CarPlay® support and other models in the Kia lineup eligible for the CarPlay® update will be announced at a later date. "The arrival of CarPlay® compatibility follows on a promise we made when Optima launched last year. These running changes and available downloads will seamlessly bring iPhone's easy-to-use interface and functionality to our newest and best-selling models," said Henry Bzeih, Managing Director Connected & Mobility Services, KMA. "Kia is taking the UVO platform to yet another level of enhancement by extending the customer's personal mobility technologies safely and easily into a Kia vehicle. CarPlay® will bring an additional element of convenience while maximizing the benefits of connectivity." 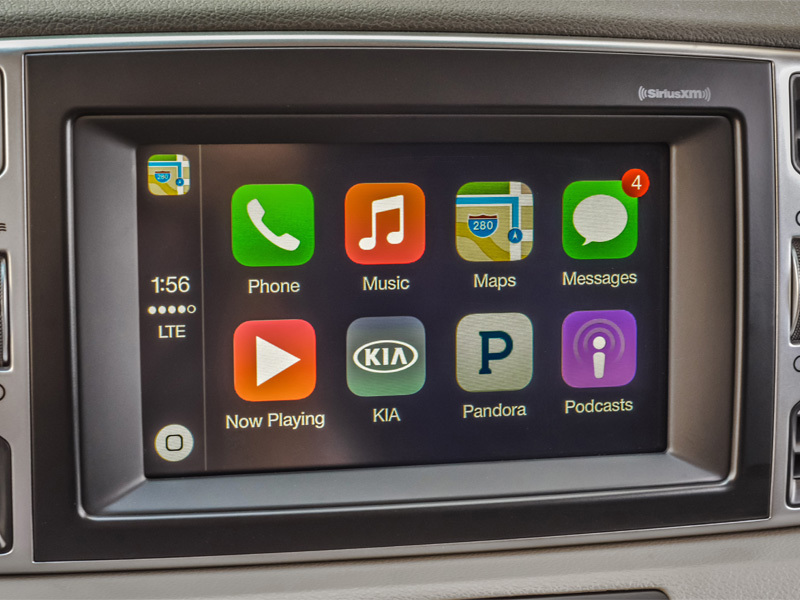 A smarter and more convenient way to use the iPhone® in the car, CarPlay® gives drivers the ability to access the device's seamless user interface through Kia's UVO infotainment system. By connecting the iPhone® into the USB port, users are able to make phone calls, access music, send and receive messages, get directions optimized for traffic conditions and more while staying focused on the road. CarPlay® also features hands-free support via Siri® voice control or the vehicle's controls and touchscreen.